400 bikes, 60 stations, and 156 miles of bikeways. This is Long Beach livability. We Also Have Discounted Plans, Including Student And Corporate Plans. Additional Terms: For the Pay As You Go plan, minutes are purchased in advance and balance of available time is reduced when used, with no expiration. For Monthly and Annual memberships, “Daily Riding Time” is the number of minutes included with your plan each day; no rollover credit; riding minutes in excess of plan minutes will be charged per minute at Pay As You Go hourly rates. 3 months minimum commitment for monthly plans. Minimum age: 18 years old to check out a bike with a credit card. 16 years old to ride. Prices don’t include sales tax. Includes 90 min daily ride time. Adjust height and check brakes before riding. For quick stops during your ride use the “HOLD” button and secure the bike to any rack. To unlock again enter your 4-digit pin code. To end your trip, just return and lock the bike to a station, or a rack within 100 feet if station is full. You can lock to any other public bike rack for a small fee. Check screen on the bike for confirmation. 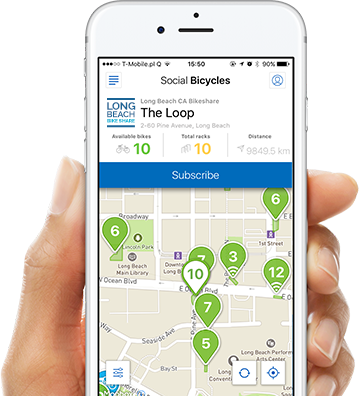 Download the Social Bicycles App to find and reserve your Long Beach Bike Share bike! With the App you can also share your rides with friends, take advantage of local promotions, and enjoy other functions to enhance your ride. Remember to ride responsibly, keep your mind on the road and your phone in your pocket while riding. Long Beach, California is a great place to get around on two wheels, whether you’re an experienced rider or new to urban cycling. Here are a few simple tips to help you feel more comfortable and confident. 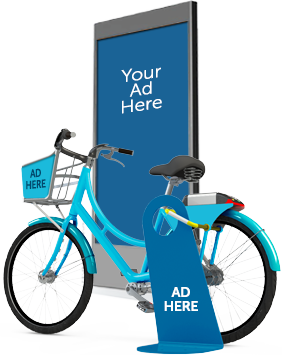 Bike share is a great vehicle for promoting your brand/business to millions of active consumers. You’ll be helping to support a healthy lifestyle, improve air quality, reduce traffic and congestion, and champion sustainable transportation for the Long Beach community. Reach residents and visitors where they live, work and play. Contact us today to discuss details — these opportunities will sell out quickly. First, you need to register for an account above. You’ll be assigned a 6-digit account number and you’ll get to choose a 4-digit member PIN. Find a bike on the System Map above or mobile app, and type your account number and PIN into the keypad on the back of the bike. You can also reserve a bike ahead of time from the website or mobile app, so the bike will be waiting for you – you’ll just need to type in your PIN when you arrive. Yes, reservations can be made through the Social Bicycles mobile app or on the web 10 minutes in advance. Do I need to take the U-lock with me when I ride? You can keep a bike out for up to 24 hours. Can I put a hold on my bike while I run errands? Yes, there is a “hold” button on the bicycle’s kepyad. Press this button and lock the bike around a bike rack to take a stop without ending your ride. Once back at the bike, just press “unlock” and enter your PIN code. To end your ride, lock a bike to a Long Beach Bike Share station or public bike rack. Insert the U-lock into the two designated slots on the back side of the bike, pushing the lock in until it latches. Wait until you feel the click and see the ““thank you”” screen on the LCD display. You can end a ride by returning your bike to any station with an open rack – you don’t have to bring it back to where you picked it up, making Long Beach Bike Share ideal for one-way trips. Find available docks on the System Map or mobile app. If the station closest to your destination is full, you can lock your bike at a public bike rack close to the station for no additional charge. If you lock your bike at a public bike rack further from a station, a $2 fee applies. If you lock your bike outside of the service area (marked on the System Map and mobile app), a $20 fee applies. Is there an incentive for users to bring bikes back to a station? Yes. You can earn a $1 account credit each time you take a bike that’s been locked outside a station back to a Long Beach Bike Share station. The City of Long Beach owns and operates the Long Beach Bike Share program. Sign up by choosing a plan above, or download the Social Bicycles mobile app and sign up on your phone. Can I temporarily lock up the bike during my ride? How to I end my rental? How do I know the bike is locked properly? The hub is full, where do I lock the bike? Lock the bike to the nearest public bike rack. Why have I been charged for docking the bike outside of a hub? There is a $2 fee for locking the bike outside of a designated hub or station. This is to account for the likelihood of sending out staff to recover a bike. There is also a $20 fee for locking a bike outside the system area for the same reason. Where can I check my rides and billing information? Log into your account at app.socialbicycles.com. We always recommend wearing a helmet, although helmets are not required by California law for riders above 18 years of age. The bike has a fault, how do I report it? You can click the “repair” button on the bicycle’s keypad, and select the type of repair category. This will greatly help us resolve the issue quickly. You can also report the repair from the mobile application. Subject please choose a subject I have a question related to my membership I want to suggest a Long Beach Bike Share station I want to sponsor a Long Beach Bike Share station I’m interested in advertising with Long Beach Bike Share Something else? Long Beach CA Bikeshare is powered by Social Bicycles. Find bikes using our app!